The LISP language was designed to work upon lists of data (LISt Processing), with a rich set of built-in functions potentially useful for Max/MSP programmers. Arbitary data structures, functions, and return-types are easy to construct using [mxj maxlispj]. And the delightfully insane thing about LISP is that lists can be lists of numbers, lists of strings, lists of functions, lists of lists, etc. Because LISP is an interpreted language, functions can be defined and sent into LISP "on the fly" to operate upon Max/MSP data. The abcl interpreter (driven from Max/MSP) is fast enough for many extensive LISP operations. There are a number of good tutorials on Common Lisp available. A fairly common complaint among Max/MSP developers is the lack of a robust set of string-manipulation and data-structuring utilities. Obviously, LISP has powerful string-processing capabilities, and data representation can become as arbitrarily complex as necessary. The [mxj maxlispj] object will catch most LISP errors and continue functioning. Full source for both the [mxj maxlispj] object and the abcl interpreter are available for downloading (see below). NOTE: Be sure to remove any existing "maxlispj/" folders, "maxlispj-help/" folders, or older "maxlisp" objects from the search path. Move the entire "maxlispj-help-0.96/" folder intact -- do not take the maxlispj.maxhelp object out of the folder! Earlier versions of the [mxj maxlispj] object for older Max, OSX and Windows machines are available here. The java source code for the maxlispj.java class that provides the link between abcl and Max/MSP. Download the abcl source from the abcl web site. Although [mxj maxlispj] will catch and handle most LISP errors, it cannot provide the debugging features that traditionally come with a LISP interpeter (i.e. no interactive debugger, break conditions, etc.). It is probably best to develop code in a standalone Common Lisp interpreter and then import the code (the "loadbuf" message to [mxj maxlispj] is useful) into Max/MSP. For debugging and development, it is probably best to use the abcl distribution. [mxj maxlispj] needs to do a lot of initialization when starting the LISP interpreter. The first [mxj maxlispj] object instantiated in a patcher may take several seconds (sometimes 10-20 seconds, sometimes even longer) to load. Be patient, even if (OSX users) the 'spinning rainbow wheel of death' appears. All subsequent [mxj maxlispj] objects will appear quickly as the initialization only has to occur once. For some reason under OSX 10.6/Max5, the first time the object's internal buffer is opened, it will also incur a short delay. Be patient, a lot is going on with this object! NOTE: One very odd situation can sometimes occur -- if a patcher has been saved to disk in a session prior to creating a [mxj maxlispj] object, the first object instantiated in the saved patcher will take a fair amount of time (30 seconds to a minute, depending on processor speed) as it allocates memory. A number of errors will also appear in the Max window about not finding certain classes, but the [mxj maxlsipj] will eventually be created and will function normally. I'm not sure why this happens. It is possible -- and in fact quite easy -- to write LISP programs that take a significant amount of time to execute. If the LISP interpreter takes too much time, Max/MSP will not be happy. This is real time, right? I'm not sure how well [mxj maxlispj] will handle a REALLY LARGE program. "riff-o-matic" is somewhat substantial, but I'm not a truly sophisticated LISP hacker. The [mxj maxlispj] object was written by Brad Garton (hey! that's me!) and supercedes the older [maxlisp] object. [mxj maxlispj] is much less 'brittle', and the earlier version runs on Windows, too (updated Windows 7 coming soon!). 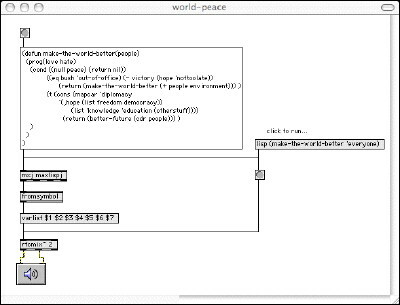 The integration of java into Max/MSP via the [mxj] object made this project possible. As always, the good people on various development mailing lists (especially) armedbear-devel@common-lisp.net and the Cycling '74 java-dev forum were invaluable. Thanks! I hope this may be useful for others; I'm having a blast with it. Let me know what you think!